For those of you who are planning a trip to..
Snuggled in the Gulf of Thailand, this island is the second largest Thai island after Koh Phuket. It’s well known for its eye-catching beaches lined with palm trees and crystal clear blue waters. From the busy and high energy atmosphere of Chaweng Beach to the upbeat yet relaxed culture of Lamai Beach to the more traditional and local life of the Bophut’s Fisherman village, the island maintains an activity for everyone. You’ll meet all types of travelers from the thrifty backpackers, who stay for a couple months to the resort residential types, who come in for a weekend. The island is huge with many sites to visit and explore. While you can easily traverse the whole island in less than a day, you’ll need more time to discover all the hidden gems. I recommend renting a motorbike if you’re comfortable with it. Ride it around until you reach a spot and then get off and explore deeper. If not, you can also rent a car. This monumental statue is found on a small island just off the north-eastern part of the island. Originally built in 1972, this statue is now a golden giant soaring 12 meters high, which makes it one of the most popular attractions. After visiting the statue, itself, you can walk around the courtyard around the base of the statue. There, you’ll find vendors selling souvenirs and other Buddhist-related trinkets, and of course, there will be food stalls. The fisherman’s village is in Bophut’s historical district, which hosts a neighborhood of boutique shops in country-side style buildings, popular restaurants, and accommodation lining the beaches. The real treat is to come on a Friday and enjoy the Fisherman’s Village Walking Street Market. There you can find a variety of things to buy or to gaze at from the local street vendors. I wouldn’t spend more than a day here since it is mainly a shopping town and you can always just visit the beach. Although there are many waterfall spots on the island, this one of the most picturesque and shows that the island’s beauty is not only found on its beaches. The Namuang waterfalls are surrounded by luscious jungle, which is easily accessible from the main road. Be warned, it’s slippery so bring the right shoes and if you’re in decent shape you’ll be able to reach the fall. The Secret Buddha garden is high and hidden away in the hills of the island. There, you’ll have breath-taking views of jungle plants and statues of animals, divinities, and people in different stances. If you really want to make your visit memorable, take a cooking class! You’ll learn from the locals about how to make your own Thai dishes using authentic ingredients. The whole island has many cooking classes to choose from, just pick one that you’d like and sign up for the class. You’ll need to set aside a day for this park if you want to avoid the crowds of people who just come in for an afternoon. 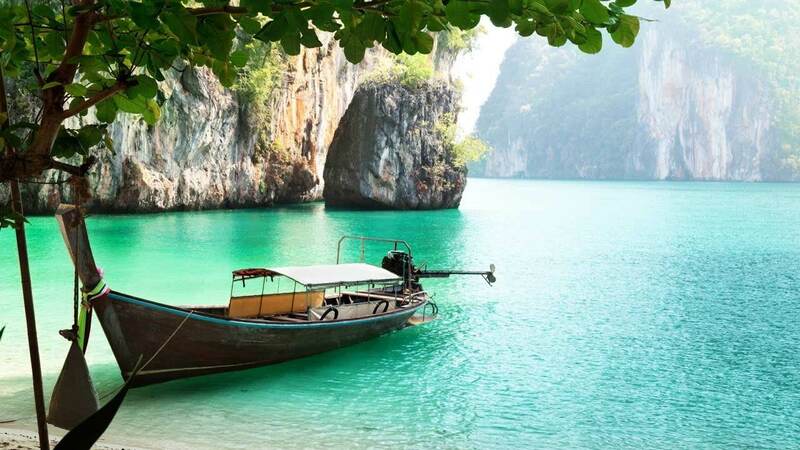 Take a boat to Ang Thong Marine Park after the full moon party so you’ll practically have the whole place to yourself. There, you can enjoy a fun-filled day snorkeling, swimming or kayaking through caves, and hike to various viewpoints. You don’t have to go to Egypt to see mummies and other death rituals. Koh Samui’s mummified monk gives insight into Thailand’s Buddhist religion and culture. The monk you’ll see died while sitting in a meditative pose in 1973 and since then his body has been put in a glass case. Surprisingly, the body has not decayed that much since his death. Visit this place, if you’d like to learn more about the Buddhist religion and culture. You’ll begin to show appreciation and respect for this religion. Looking to know more about Thai folklore and older stories? These rocks have their own story surrounding their wonder since locals discovered it many years ago. The tale is about an old couple on Samui who go to a neighboring island to ask for a girl’s hand in marriage for their son. On their journey over, their boat was caught in a violent storm and unable to swim to shore, they died and were turned into rocks. The views from the rocks are breathtaking! You can see as far as the next island over the crystal clear blue water! Hopefully, all these reasons have convinced you to add Samui Island as a stop on your Thailand adventure! Only here can you relax on the beach one day and then go caving the next! Author Bio: This article is written by Paul Young in support of Ferry Samui.